The only ancestors known of this family line is my 9th great-grandmother Susan Longenecker. She was most likely born around 1628 at Blankenloch then a village located in that area of present day Germany encompassed by the Karlsruhe region of Baden-Wurttemberg. Susan married Georg Muller, a native of Blankenloch, prior to 1652. To this union at least one known off-spring was produced that being my 8th great-grandfather Peter Samuel Muller, through whom this family lineage continued. Susan probably lived out her day at Blankenloch although it is not known when or where she died. The practice of adopting hereditary surnames began in the southern areas of Germany during the second half of the 12th century, and gradually spread northwards during the Middle Ages. With the passing of generations and the movement of families moved from place to place many of the original identifying names were altered into some of the versions that we are familiar with today. Over the centuries, most of our European ancestors accepted their surname as an unchangeable part of their lives. Thus people rarely changed their surname. Variations of most surnames were usually the result of an involuntary act such as when a government official wrote a name phonetically or made an error in transcription. Research into the record of this Longenecker family line indicates that the variations, meanings and history of this surname is most likely linked to that area of Europe where German linguistic traditions are commonly found. Most modern family names throughout Europe originated from with of the following circumstances: occupation (i.e., Carpenter, Cooper, Brewer, Mason); locational (Middleton, Sidney, or Ireland) or topographical (i.e. Hill, Brook, Forrest, Dale); nicknames (i.e., Moody Freeholder, Wise, Armstrong); status (i.e. Freeman, Bond, Knight); and acquired ornamental names that were simply made up. Longenecker is an altered spelling of the Swiss German name of Langenecker. Langenecker is a habitational name for someone from any of several places called Langeneck which was originally derived from the Old High German words lang ‘long’ + egga ‘corner’. Following the Crusades in Europe in the 11th 12th and 13th centuries a need was felt for an additional name. The first hereditary surnames on German soil are found in the second half of the 12th century, slightly later than in England and France. However, it was not until the 16th century that they became stabilized. The practice of adopting hereditary surnames began in the southern areas of Germany, and gradually spread northwards during the Middle Ages. The German surname Longenecker, and its variant spellings, have traveled widely in many forms throughout Europe. The early Longenecker families originally came from northern Switzerland and southwestern Germany. During the 18th century many of them immigrated to America and settled in the colony of Pennsylvania. The Longenecker name does tend to be confused with the English versions, and particularly so in the United States where immigration from both countries was at its height in the 18th century. In any case the name from both countries is often in the same spelling, which is perhaps not surprising as they share similar pre 7th century "Anglo-Saxon" roots. During the 17th, 18th and 19th centuries hundreds of thousands of Europeans made the perilous ocean voyage to North America. For many it was an escape from economic hardship and religious persecution. For most it was an opportunity for to start over, own their own land, and make a better future for their descendents. Immigration records show a number of people bearing the name of Longenecker, or one of its variants, as arriving in North America between the 17th and 20th centuries. Some of these immigrants were: Daniel Longenecker who in 1749 came to the Pennsylvania colony; David Longenecker who arrived in America prior to 1718 and settled at Lancaster, Pennsylvania; Peter Langenecker arrived in 1738 at Pennsylvania. Many German surnames were re-spelled in America because of the close relationship between the English and German languages. In some cases Germans are able to transform their names to the English form just by dropping a single letter. After the start of the first World War, Germans in great numbers Anglicized their names in an effort to remove all doubt as to their patriotism. Many German names have their roots in the Germanic middle ages. The process of forming family names began around the year 1100 and extended through 1600. All social classes and demographic strata aided in the development of names. First Names (Rufnamen) identified specific persons. Over time the first name began to be applied to the bearer's whole family. At first through verbal usage, family names (Familiennamen) were later fixed through writing. Until the 17th century, first names played a more important role. The earliest family names derived from the first name of the first bearer (Patronym). Later names derived from the place of dwelling and location of the homestead. If a person of family migrated from one place to another they were identified by the place they came from. Of more recent origin are names derived from the vocation of profession of the first bearer. These names comprise the largest group and the most easily recognizable, for they tell what the first bearer did for a living. Another group are names derived from a physical or other characteristic of the first bearer. Finally, there are names that tell you the state or region a first bearer and his family came from; the age old division in tribes and regions (low German, middle German and upper German) is often reflected in names. Throughout the centuries, surnames in every country have continued to unfold and expand often leading to an overwhelming number of variants. As such one can encounter great variation in the spelling of surnames because in early times, spelling in general and thus the spelling of names was not yet standardized. Later on spellings would change with the branching and movement of families. Spelling variations of this family name include: Longnecker, Longaker, Longenencker, Langnecker, Longacker, Langenecker, and many others. Searching for more Information about this and other surnames? There are no* known associated armorial bearings for Longenecker or its variant spellings recorded in Reitstap’s Armorial General. No Longenecker family mottoes are known. It is unusual for a German Achievement to include a motto. * Reitstap, J.B., Armorial General, Volume II, Genealogical Publishing Co., Baltimore, Maryland, 1965. 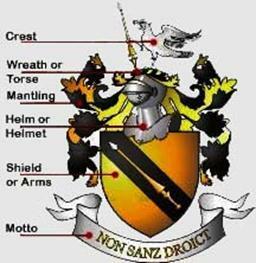 Crest - The word crest is often mistakenly applied to a coat of arms. The crest was a later development arising from the love of pageantry. Initially the crest consisted of charges painted onto a ridge on top of the helmet. Wreath or Torse – The torse is a twist of cloth or wreath underneath and part of a crest. Always shown as six twists, the first tincture being the tincture of the field, the second the tincture of the metal, and so on. Mantling – The mantling is a drapery tied to the helmet above the shield. It forms a backdrop for the shield. Helm or Helmet - The helmet or helm is situated above the shield and bears the torse and crest. The style of helmet displayed varies according to rank and social status, and these styles developed over time, in step with the development of actual military helmets. Shield or Arms - The basis of all coats of arms. At their simplest, arms consist of a shield with a plain field on which appears a geometrical shape or object. The items appearing on the shield are known as charges. Motto - The motto was originally a war cry, but later mottoes often expressed some worthy sentiment. It may appear at the top or bottom of a family coat of arms. Susan Longenecker-1 was born on Abt. 1626 in Blankenloch, Karlsruhe, Baden-Wurttemberg, Germany. She died on Aft. 1652 in Blankenloch, Karlsruhe, Baden-Wurttemberg, Germany. She married Georg Muller before 1652 in Blankenloch, Karlsruhe, Baden-Wurttemberg, Germany. He was born in 1626 at Blankenloch, Karlsruhe, Baden-Wurttemberg, Germany. He died on Aft. 1652 in Blankenloch, Karlsruhe, Baden-Wurttemberg, Germany. Child of Susan Longenecker and Georg Muller is Peter Samuel Muller, B: 1652 in Blankenloch, Baden-Wurttemberg, Germany, D: 25 May 1707 in Blankenloch, Baden-Wurttemberg. Additional information about our DIRECT ANCESTORS as well as a complete listing of individuals with this surname may be reviewed by clicking on the following LINK. will likely improve your results. The different searches will give you many different ways of using Google and the Internet to find ancestry information about this or any other Surname. Researching the locations where my ancestors lived has provided me with valuable evidence needed to fill-in the gaps in my family trees. It has also led me to many interesting facts that enhance the overall picture of each family group. The names of states and counties on the following list were derived from the known places where the persons in the “Direct Ancestors” list (see above) were born, married, and / or died. Use this LINK to find out more about the locations listed above. will assist in discovering Ancestral Locations. These web sites comprise only a small portion of what is available for researchers interested in learning more about the areas in which their ancestors lived. The documents and headstones contained within the “Source Documents Archives” have been located during my research of this family, and used as evidence to prove many of the facts contained within the database of this family’s record. Most of these documents can be considered as primary or secondary evidence. Primary evidence is usually defined as the best available to prove the fact in question, usually in an original document or record. Secondary evidence is in essence all that evidence which is inferior in its origin to primary evidence. That does not mean secondary evidence is always in error, but there is a greater chance of error. Examples of this type of evidence would be a copy of an original record, or oral testimony of a record’s contents. Published genealogies and family histories are also secondary evidence. Classifying evidence as either primary or secondary does not tell anything about its accuracy or ultimate value. This is especially true of secondary evidence. Thus it is always a good idea to ask the following questions: (1) How far removed from the original is it, (when it is a copy)? ; (2) What was the reason for the creation of the source which contains this evidence? ; and (3) Who was responsible for creating this secondary evidence and what interest did they have in its accuracy? You are welcome to download any of the documents contained within this archive. us via the contact information found at the end of this page. Use the following LINK to view the source documents pertaining to this family. your research about this topic. Your genealogy research of this surname can be facilitated by use of SURNAME WEB. This website links to the majority of the surname data on the web, as well as to individual family trees, origin and surname meaning if known, and many other related genealogy resources. SURNAME FINDER provides easy access to free and commercial resources for 1,731,359 surnames. On each surname specific "finder" page, you can search a variety of online databases all pre-programmed with your surname. Use ALL SURNAMES GENEALOGY to get access to find your surname resources . There are almost 1300 links in this directory. Linkpendium Surnames - Web sites, obituaries, biographies, and other material specific to a surname. Cyndi's List - Surnames, Family Associations & Family Newsletters Index - Sites or resources dedicated to specific, individual family surnames. Free Genealogy Search Help for Google - This free genealogy site will help you use Google™ for your research. It will create a series of different searches using tips or "tricks" that will likely improve your results. The different searches will give you many different ways of using Google to find ancestry information on the Internet. FamilySearch.org - Family History and Genealogy Records - The largest collection of free family history, family tree and genealogy records in the world. Top Genealogical Websites - These mighty roots resources compiled by “Family Tree Magazine”, will give you the power to bust through research brick walls and find answers about your ancestors—all from your home computer. SurnameDB Free database of surname meanings - This site SurnameDB.Com contains a large FREE to access database (almost 50,000 surnames) on the history and meaning of family last names. The following Link will take you to our library of genealogy reference books. Here you will find bibliographies, family histories and books about names. In addition, there are texts that pertain to ethnic and religion groups, history, geography as well as other books that will assist you with your research. During my research I have collected images and photographs that are of general interest to a particular family. Some of them are presented on this website because I believe they tend to provide the reader with additional information which may aid in the understanding of our ancestors past lives. ancestral family we would greatly appreciate hearing from you. Use the following LINK to ascertain whether we have any images that pertain to this family. Use the power of Google™ to find more interesting images about this topic. A Click on this button will link you to the Google Images Search page. Enter the topic you are searching in the box and click “Search Images”. At the “Images” display page you will see the image, as well as the website of which it is associated.